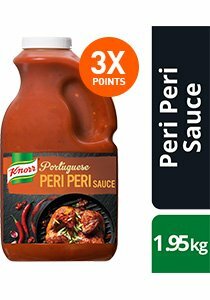 A deeply flavourful Portuguese peri-peri sauce made with Bird’s Eye chillies, onions, peppers, garlic and lemons. Add the right amount of heat to burgers, wraps, sandwiches, pies, braised dishes and wedges. Sauce for burgers, wraps, sandwiches, pies, braised dishes, wedges. To ensure a gluten-free meal, avoid cross-contamination with gluten during preparation. Weight per serving/portion - 30 g.
May contain soybean, milk, sesame, peanuts and tree nuts. # Contains naturally occurring glutamates. ^ Suitable for vegetarians who consume dairy and egg. After opening, store refrigerated for up to 5 days or freeze.